Successfully Added Chess Clock - 3 Chess Modes + 3 Countdown Modes to your Shopping Cart. Chess Clock with the three most common Chess Timers, plus three special countdown modes for added fun, direct from China at low wholesale prices. Fans of Chess will be glad to have this chess accessory to add to the excitement of a fast paced game, whether in the relaxed normal mode, or in Traditional and even in International Match Rules. With its special countdown mode, it is also a great chess training tool to speed up your timing and thought process as you race against the clock to make your next move. 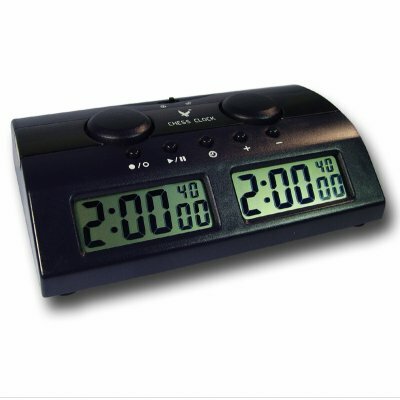 Easy and intuitive to use, this Made in China Chess Clock is a accessory any fan of Chess should not be without.